How would you rate the 2013 #F1 SHELL #BelgianGP? 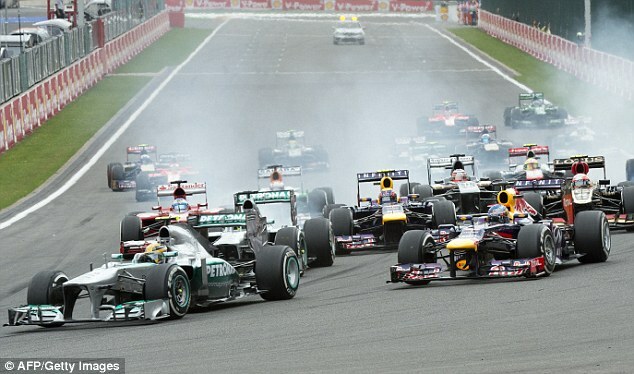 As the dust settles on the 2013 Formula 1 Shell Belgian Grand Prix what was your thoughts on the race? Do you think yesterday’s qualifying lottery had an effect on the race? Please let us know why you voted the way you did in the comments section below. You all laughed at Mr E.’s sprinklers. Well who’s sorry now?! I prefer God’s sprinklers tbf… too many issues with Bernie’s ones.. you’ll get all sorts of conspiracy theories … Lets hope Michelin does not get the contract for tyres next year… ultra durable tyres! Was mainly joking, the race was so boring compared to the Quali though it was a tempting thought LOL. And you are right, I prefer the tires to offer competing strategies that arrive at the end of the race within margin of error. Makes for the best racing! Was ok… bit boring. Stewarding is really bad though and killing the racing. I was actually surprised that, given one incident involved both Grosjean and Perez, they didn’t give both a penalty. Personally didn’t mind to much about that, but it was a bit of a none event, and the stewarding is mostly ridiculous. Result was alright, but race was a bit flat, heres hoping monza is a bit more exciting. I can’t see that race as boring. We had action all over the place and fights for every position but the lead. Alonso’s truckload of overtaking moves made for good entertainment. Button provided lots of goot moves, too. On a serious note, there was no suspense for me… it could just be me though. Lots of overtaking and Vettel’s overtake in Hamilton sealed the deal for him. I gave it a 6. I was hoping for just a bit of rain or maybe a start in the rain as that might just have given Mercedes some more pace versus Red Bull. But ultimately the race was ok, some overtaking happening through the field but not at the very top, which is what most neutrals would want generally. Congratulations to Vettel on a solid and dominant win today, their setup was right, they were by far the quickest car today. Hamilton and Rosberg finished 3rd and 4th respectively so I won’t complain, it was a solid result for Mercedes but hopefully some improvement can be done for the next races. Great race by Alonso too, Driver of the Day would have to go to him or Vettel in my humble opinion. What this race showed was that Webber is utterly hopeless. While his team mate runs away with it, he fights for 5th – talk about being past your sell-by date. Normally I would not agree with that statement Danilo but facts are facts. Webber should just keep on driving until the end of the season and not complain as he is in danger of looking like moaning the whole time. Vettel was superb in that car. Disagree with you guys. Clutch problem at the start caused problems. I think the only mistake he made was over driving to make up for it, cooking the tyres. Alonso did a better job on the tyres and was more aggressive with overtakes. This was because most of his overtakes were done at the start of the race, whereas Webber got caught behind some pretty quick machines. Seb was superb though, one of his best races in my opinion. Boring 43 laps after the first… justifying Rosberg coming departure to the scuderia and Kimi leaving F1, oh sugar! I wasn’t supposed to say! Anyhow Vettel will be crowned for the 4th time! Cheerio! LOL… why justifying Rosberg’s departure? You think he should leave Mercedes? Clear indication the German cheats have lost the advantage from their illegal tyre test. The German cheats should be worried about Mclaren who look like they have gotten the car to start performing. Cav, i love the passion in your posts. He would have passed Vettel otherwise.